" If... the people legitimately... set parliament and government the task of working out a way of leaving the EU, then... the people should also be able mark their homework and pass a verdict on their efforts." 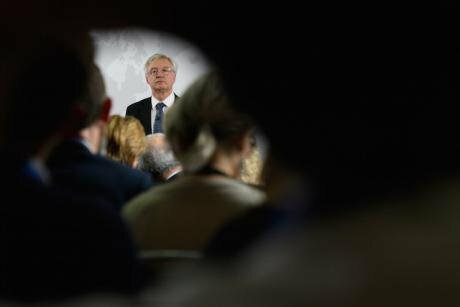 Secretary of State for Exiting the European Union David Davis delivers a speech in London, June 6, 2018. Leon Neal/Press Association. All rights reserved. But as has become apparent, in the case of the UK, nobody really knows what those requirements actually are and a significant amount of energy has been consumed over the last two years in disputes over what the respective roles, responsibilities and powers of Parliament and the executive are, what the precise status of the referendum is and who, if anyone, is responsible for interpreting it. The Miller case exposed confusion and uncertainty even over who had the power to begin the process. There is no clear constitutional guidance, either, on how or by whom it should be executed, scrutinised or concluded and, crucially, how and by whom the outcomes should be approved or legitimised. This messiness reflects the UK’s famously uncodified constitution, which means its basic rules are not systematically laid out in a single, document which governs the relationships of key elements of the political system. This means that the UK constitution is very flexible which has served it well in some respects, not least in adapting to European Union membership. But it means, above all, that the constitution is political. Above all, sovereignty and power in the British constitution has not been a matter for the courts, as in many codified systems, but has rather been established and maintained by political struggle, which is why the resolution of the question of who should trigger Article 50 by the courts is somewhat problematic in the UK context. A key principle of the British constitution is the notion of ‘parliamentary sovereignty’ – that Parliament has the sole right to make or unmake law in its territory. For many Eurosceptics, it is this that made the British system incompatible with EU membership, which (as confirmed by the Factortame Case in 1991) instituted a higher body of law over that of statute. But this was merely a qualification of Parliamentary sovereignty, and one which Parliament imposed upon itself and (as Brexit perhaps proves) can also remove. However, even if that qualification is eventually removed, there are, unfortunately for Parliamentary Sovereignty enthusiasts, many more than that. Significant constitutional changes made under the Blair and Brown governments (including devolution and the creation of a Supreme Court), as well as Cameron’s (including fixed term parliaments, the creation of regional mayors and English Votes for English Laws), whilst by no means part of any strategic masterplan, have also de facto altered Parliamentary sovereignty. In some respects it has been strengthened – the Prime Minister no longer has the power to dissolve Parliament against its will. In other respects, it has weakened: it has lost control over key areas of domestic policy, including personal taxation, to the Scottish Parliament and the Welsh Assembly. One of the more significant changes in recent years, it turns out, has been the use of referendums to endorse or reject many such reform proposals. It means that, as Vernon Bogdanor has pointed out that a ‘new principle … of the sovereignty of the people’ has entered into the British constitution (Bogdanor 2016, 314). Thus, the age old struggle over sovereignty and power between the Crown (now represented by the executive) and Parliament continues, but now complicated by two other important participants: the devolved authorities and, crucially, the people. Brexit, in particular, the question of how the process should be carried out has exposed the ambiguities in the relationship between these participants and where the boundaries of authority and sovereignty lie. Ultimately, this raises profound, constitutional questions about who governs: Ministers of the Crown, Parliament, the devolved assemblies or the People? The flexible and political nature of the constitution means that the response of politicians and political parties to the referendum was always going to be crucial in determining the ‘constitutional requirements’ necessary to withdrawal from the EU. In the immediate aftermath of the referendum, with both main parties in states of disarray, and unclear how to respond, backbench MPs had a rare opportunity to set the terms of debate, and an analysis of the first six months of debates in Parliament following the referendum, reveals that five distinct positions emerged which have shaped the debate, are still relevant and still being argued over now. Whilst these are on the whole politically motivated positions, taken because of their perceived advantage to either a Leave / Remain or a ‘Hard’ or ‘Soft’ Brexit position, have significant constitutional implications at least as profound as the outcomes themselves, and each leave questions about the developing nature of the UK constitutional settlement. Position 1: The Executive should make the key decisions and control the process. Some argued for this on the basis that the referendum was an ‘instruction … given by the ultimate holders of sovereignty in this country—the British people.’ There is therefore no role for Parliament in interpreting the meaning of the result. Indeed, some went further and argued that it is simply legally and constitutionally right that the process be ‘a matter for the royal prerogative’ – and therefore ministers – rather than Parliament. Many made a more pragmatic case arguing that ‘we need to unbind the hands of our Ministers and allow them to get out there … and negotiate the excellent deal that we know they can get’ but this has a similar constitutional effect. On the one hand, it denies the right of Parliament to meaningfully contribute to the process, thus effectively subordinating Parliament to the executive. On the other hand, whilst the argument for doing that uses the popular sovereignty expressed in the referendum as a justification, it treats the people’s role as a once and for all, final decision, thereby limiting the ‘sovereignty’ of the people to a once only event. The outcome, therefore, looks something like a power grab by the executive and a weakening of both parliamentary and popular sovereignty. Position 2: Parliament should set the agenda, support key decisions and steer the process. In a flexible constitution like the UK’s convention really matters and MPs pointed out that – as demonstrated by the Lisbon Treaty – it is ‘clearly established that a major treaty change has to be triggered by an affirmative resolution of the House’ meaning Parliament must have a significant role. This makes practical sense, too, since ‘we cannot extrapolate from the result of the referendum the specific terms upon which the majority of those in this country wish their relations with the European Union now to be governed’. Whilst both these arguments come from a position that does not deny the validity of the referendum, they assert the importance of Parliament’s role as a deliberative chamber, scrutinising in detail and coming to reasoned, considered decisions which neither the public nor the executive can. However, this begs some questions: if we accept that Parliament must have a role in interpreting the will of the people how much room for interpretation is there? And when does it become blocking ‘the will of the people’? What – in other words – are the limits of Parliament’s authority in this respect? If the referendum was an instruction, who was it directed at? Some attempted to address this by simply asserting the absolute principle of Parliamentary Sovereignty, arguing that denying Parliament a vote is ‘a constitutional outrage’ because ‘referendums are advisory and … Parliament is sovereign’ and arguing that Parliament should therefore be free in principle to overturn it. But whilst this may be consistent with a strict interpretation of Parliamentary Sovereignty, it is politically very problematic. It does not recognise the fact of popular sovereignty that – like it or not – has become established practice through the use of referendums to endorse or reject some kinds of decision. Position 3: Government and Parliament need to work together in order to achieve the best possible outcome. At first glance, a more balanced, pragmatic position recognises the legitimacy of the referendum whilst seeking unity in the ‘national interest’ and to the government’s own desire to make a success of it. Following a relatively close referendum result, Parliament’s role, from this point-of-view is to ensure wider public support – from both Leave and Remain supporters – so that ‘fellow citizens can have absolute confidence in this perilous process’. Besides, the sheer complexity of the issues involved including the ‘citizenship rights, immigration rules, employment and social rights, agriculture, trading relations with the EU and third countries, and Scotland and Northern Ireland’ means that scrutiny of and approval for the government ‘aims, objectives and red lines’ in the negotiations is essential. For this reason, it is essential that the executive and Parliament can work together. If they do then the government is ‘far more likely to get a good deal’ because it will have ‘managed to bind both sides of this House and both Houses of Parliament into a strong negotiating position’. The implications of this is that there is a division of responsibility based on appropriate areas of competence: the people issue instructions via a vote, Parliament interprets and scrutinises it (including endorsing the timings) and the Executive negotiates and implements it. What this requires, however, is two things: firstly, a level of compromise on all sides which has not really been forthcoming. This has to be at least partly because the control over the process itself has been up for grabs: who controls the process, gets what they want and therefore it is worth investing energy in doing so. Thus, secondly, it requires a means of defining and arbitrating between those relationships. If something like this had been in place (in the form of a written constitution, say) then the fight is worth less. Perhaps we would have had less wrangling over who runs the show and more focus on what the outcome should be. Position 4: It is right and necessary that devolved assemblies participate meaningfully in the process. The trouble with the three positions set out so far is that they ignore another fact of the evolving constitution. Whilst the UK is still in principle a unitary system (and the referendum was UK wide), it does in practice contain some features of a federal one, albeit in a quasi and somewhat lop-sided way . There is, at the very least, therefore, a strong argument to suggest that the government needs to be sensitive to the divergent ways the constituent nations and London voted, which perhaps should have meant greater involvement than they have had so far. Thus, whilst there is no strictly legal obligation for the government to consider the demands of the Scottish (or Welsh or N.I or London) government, it may in practice make sense to do so. This illuminates another ambiguity which begs some important questions. Devolution is by now well established: the 2016 Scotland Act recognises the Scottish government and parliament as ‘a permanent part of the United Kingdom’s constitutional arrangements’. Despite this, there are still tensions over the limits and extent of the authority of the assemblies (the current stand-off between the Scottish and UK governments over the return of powers from the EU to the UK is illustrative of this). Would it not, therefore, make sense to have some consistent, transparent and clear rules about what its relationship to the UK Parliament and other constituent parts of the UK? In short, how can the relationship between the sub-governments and the centre be regularised and transparently governed? Position 5: Voters should have the right to accept or reject the terms of any deal in a referendum. In the first six months after the referendum, the idea of having a further referendum on the exit package / outcome of negotiations was a very niche position, articulated by a few on the Labour benches and the remaining Liberal Democrats. Geraint Davies, who was one of the early outliers on this argues that once the electorate have a clearer picture of a post-Brexit Britain which they had not got from the referendum campaign ‘they will have an increasing appetite for a referendum on the exit package’. One might have expected this argument to retreat somewhat as the process went on and opinion perhaps coalesced around a compromise. However, the argument for a referendum on the deal has not gone away and has in fact gained credibility, articulated in a popular fashion by the ‘People’s Vote’ campaign. Whilst this has been initiated by anti-Brexit campaigners because it is hoped that the 2016 referendum decision will be reversed, there are other reasons why this may be the only satisfactory way of settling the issue of Brexit for now, whatever the result of such a vote might be. First, endorsing the proposals recognises the reality of how we got here in the first place. If we accept that the people legitimately voted to set parliament and government the task of working out a way of leaving the EU, then it only seems right that the people should also be able mark their homework and pass a verdict on their efforts. A ‘guarantee that people will be able to vote on the destination as well as the departure’ would provide legitimacy for the outcome of negotiations on the same basis as the instruction to begin the process, as Tom Brake put it in 2016. Secondly, it provides a way to break the impasse and draw a line under the bitter divisions that Brexit has exposed both within the political elite and the wider population. Thirdly, it recognises the fact that our political system in its current form cannot resolve it. We have a minority government in a majoritarian two party system in which both main parties are divided and unable to come to clear agreements between themselves, never mind with each other. Thirdly, it recognises the fact that referendums have – for good or ill – become part of the UK’s constitutional practice and therefore ‘the people’, alongside the Parliament and the Executive, is here to stay as a key location of sovereignty in the British political system. So, whilst Brexit has exposed some of the ambiguities at the heart of the British constitution about power and sovereignty, it also points us towards a potentially appropriate resolution. What is clear is that traditional ideas of parliamentary sovereignty simply don’t cut it. Referendums, devolution, the changing role of the courts (to name but a few) have all qualified it. The logic of the UK’s evolving constitutional practice and the need to come to a reasoned and reasonable settlement demands, therefore, a strong role for Parliament in deliberating, interpreting and shaping the response to the referendum, to be carried through by a coherent executive governing with and through Parliament and subject to its scrutiny, with the final result legitimised by a ‘People’s Vote’. This must all be done in partnership with and with appropriate provisions made for the devolved authorities. This may be wishful thinking, but it perhaps provides the contours for a settlement on how the British constitution might work in the future, too, in or out of the EU. Whilst it is beyond the scope of this article to discuss precisely how central to this is codification – writing it down into a clear framework so that rules, relationships and responsibilities are transparent and understood by all participants, including the procedures in place for changing it, will be vital to a settled, just and properly functioning system. At present, it is not clear we have this. What we do have is mess and deadlock. The government is wracked by division and seems congenitally unable to make a clear decision, Parliament has had to fight against being ignored, blocked and bypassed, whilst the struggle is now on for a People’s Vote. Whatever the outcome, what happens next, and crucially, how it happens may shape our constitutional settlement for many years to come.